When it came to the interior, it may be said that the topography was largely a matter of the map-maker's imagination, but there was no one to challenge it. Several men penetrated the territory in the early years of our occupation, but their reports told little that could be used as a basis of accurate statement. In later years a few adventurous individuals ascended the Yukon from St. Michaels, others crossed Chilkoot pass and descended the river by the chain of lakes. Most of these pioneers sought the solitude of the north as a result of failure and disappointment, or were driven from civilization because they were no longer useful members of society. What white men they found in Alaska were descendants of the hardy Hudson Bay trappers and hunters, who had formed a chain of settlements throughout the country at the time of Russian occupation or immediately after the purchase by the United States. But these men cared little for and contributed nothing to a knowledge of our great possession in the north. We did not learn to know Alaska until it became worthwhile, until its secret was wrested from the soil, and it became the great mag­net for the world's unstable population. There are large sections of Alaska, on the mainland, in the interior and on its many islands, suitable for agricultural pursuits - an economic fact upon whose appreciation the proper development of the country depends. Alaska must not be simply stripped of its mineral treasure; this must help to enrich the settler, and afford him opportunities of molding the country in ways that will soonest bring it the joys of civilization. The soil of the country is rich and its val­leys are luxuriant every summer with wav­ing acres of wild hay. Experiments have demonstrated that the hardier cereals and all manner of vegetables can be raised with profit. A government agricultural station has been established at Sitka for experiment, and its reports have been most encouraging. The long days of summer sunshine - when the sun is below the horizon only an hour out of the twenty-four - cause vegetation and cereals to develop with great rapidity. It is not a question of days or weeks with their growth, but simply a matter of sun­shine and light. The hundreds of islands of the Aleutian peninsula will someday be dotted with farms and stock-ranges, while the interior is capable of supporting an affluent population. There will come a time when Alaska will be one of the wealthiest pos­sessions of the American domain. On July 19, 1897, a steam­er arrived from the north with about a hundred and fifty Klondikers on board, their great buckskin sacks almost bursting with gold dust and nuggets. All had money, and several of them had each over a hundred thousand dollars worth of the precious yellow stuff. Within twenty-four hours the news had spread all over the world and the rush to the new Eldorado set in immediately. Miners came from England, France, Germany and Spain, while South Africa and Australia gave up their prospectors by the thousand. The mining regions of the United States were threatened with depopulation. 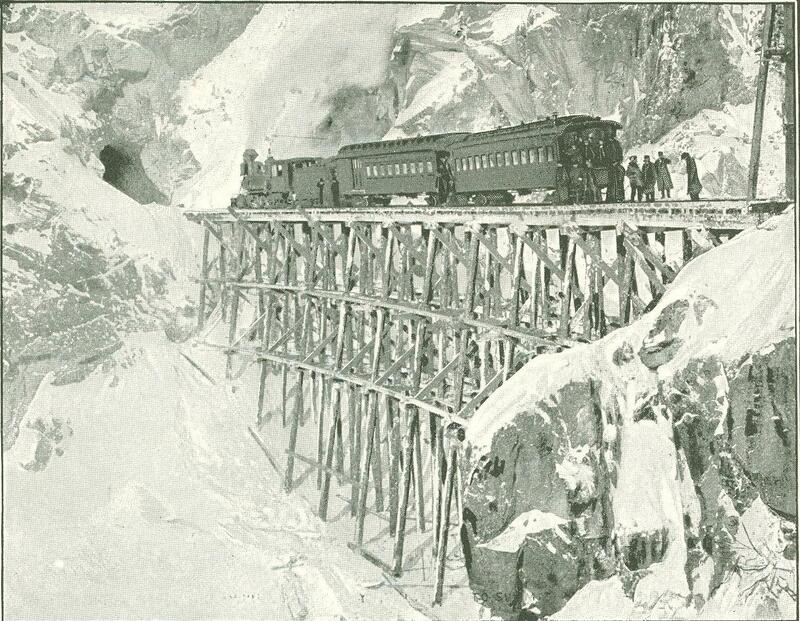 Chilkoot pass and Dyea, the route selected by the Indians for years in their journeys from the coast to the interior, were finally abandoned by the majority of the immigrants; White pass, with Skagway as the port of entry, became the favorite route. This was seen to be the logical path for the iron horse to make his entry into the Yukon valley, getting over the range at the lowest altitude. 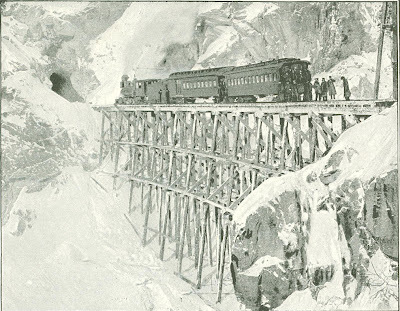 English and American capitalists soon had their engineers on the spot, and the work of building the White Pass and Yukon railway followed close upon the preliminary surveys. The route starts from Skagway, traverses White pass, descends into the Yukon valley by way of the chain of lakes and ends at Fort Selkirk, on the Yukon, over three hundred miles from Skagway. 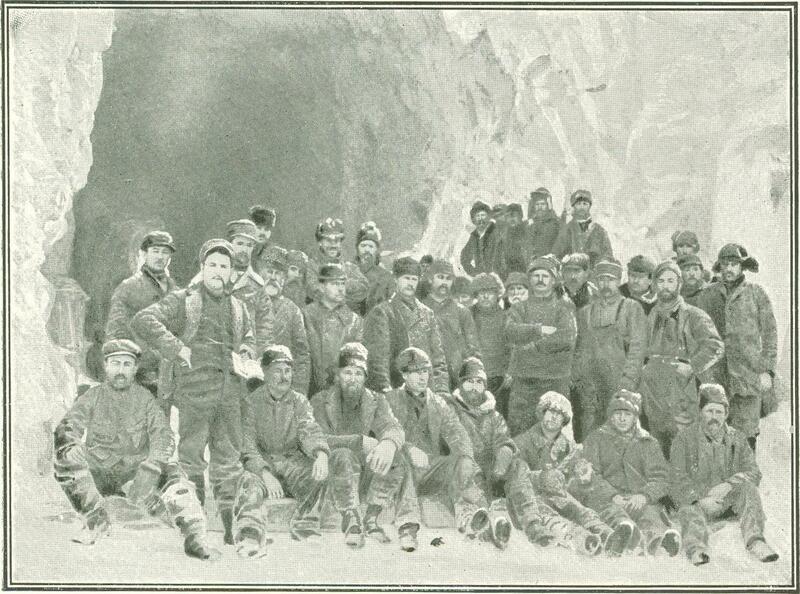 The twenty miles between tide-water and the top of the pass presented a problem of great difficulty. In this there is a rise of two thousand eight hundred and fifty feet, nearly all of which must be overcome in one part. The distinguishing feature in accomplishing this is the employment of many sharp curves, built with great skill on shelves in the face of the rock. By this means a maximum grade of 3.9 per cent., or two hundred and six feet to the mile, has been ob­tained. Few railroads not depending on the cog can boast of such a steep gradient. Begun in the spring of 1898, the work steadily advanced under a force of one thousand five hundred workmen, and in days twenty-two hours in length. On the 20th of last February the first train arrived at the top of the pass, and the ter­minus at Fort Selkirk will probably be reached before the close of this year. The road is a single-track narrow-gage, and its equipment is light, but its mission is a merciful one, and puts an end to the terrible discomfort and danger of the overland route to the new Eldorado. So far the cost has been excessive, something like sixty thousand dollars a mile, but the very difficult conditions met with in the begin­ning will disappear in the descent to Fort Selkirk, and the construction consequently will be much cheaper. through trains from San Francisco to St. Petersburg are not of the near future. The White Pass and Yukon is not to be thought of as the first link of a scheme at present impracticable. For some time to come it will be a modest affair, and would fail for lack of sustenance were it not for excessive passenger and freight rates. One may ride on its cars for twenty cents a mile or ship freight at charges equivalent to one hundred dollars per ton between Chicago and New York. The development of the country through which the road will pass will soon reduce these high rates. At all events, they are so reasonable in comparison with those of the Indian packers, who have been asking from fifteen to forty cents per pound to get merchandise over the pass, that no one is likely to complain at the company's getting back in this manner some of its outlay. The northward traveler landing at Skag­way is now met at the wharf by hotel vans, and the ubiquitous hotel runner makes the occasion hideous just as he does in other cities. The town has a population of about eight thousand, resident and transient, and boasts upward of twenty hotels. It has a telephone system, electric lights, water-works, a fire department, a company of National Guardsmen, schools and churches. But the most important of all is the railroad, and next comes a tele­graph line soon to run far into the interior as a result of Canadian enterprise. 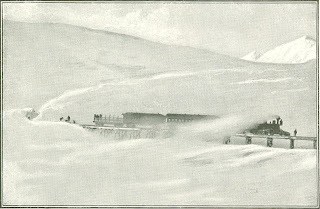 When the future fortune-seeker arrives at Fort Selkirk after a comfortable railway journey, as he will do after a few months, there will be many directions in which he may strike out, for the thousands of pros­pectors entering Alaska have brought news of rich gold-fields in other localities. For a time all roads led to Dawson, but the word Klondike has since been in dan­ger several times of being superseded as a synonym of the miners' paradise. Last August the Atlin district, eighty-three miles north of Skagway, was discovered and developed by Americans. 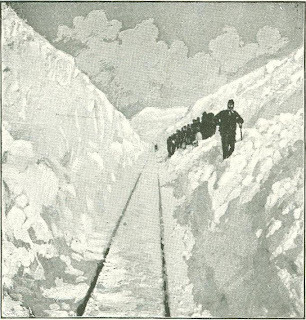 Upward of fifteen thousand claims were staked during the fall, and then the miners were driven to tide-water by the snow and cold weather. While these men were preparing to return to their holdings and work them, the British Columbia Parliament, in session at Victoria, passed an alien exclusion act, de­priving Americans from holding or acquir­ing, by purchase or otherwise, any claims in the province. 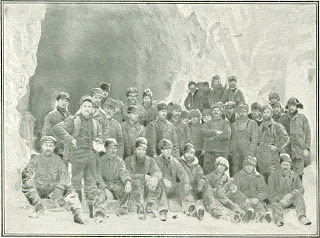 Very few of the Atlin miners succeeded in getting their claims recorded, and under the operation of the alien act all such claims reverted to the crown. Thus the work of the vast majority of the American miners in the district has been lost. There is a strong impression that the passage of the act is a part of a scheme to consolidate the interests of the whole region under the management of a syndicate - a Cecil Rhodes mining trust transferred from South Africa to northern British Columbia. The exclusion act was passed early in January, and proved a great surprise, not only to the Americans, but to the mass of the residents of British Columbia. When the news of the exclusion act reached the Atlin miners, many became disheartened or threatened fight, but others more wise abandoned their Canadian proj­ects and crossed over into American posses­sions. The Porcupine mining district on the Dalton trail drew many, and several rich strikes are reported, but this, unfortu­nately, is still too near the indefinite border for the men to feel sure of the protection of the American mining laws. The boundary question is one that should be settled at the earliest possible moment. The British Columbia mounted police have not been free from suspicion of maintaining a somewhat elastic border line that has been more than once stretched to include districts of great mineral wealth. Such a charge has, indeed, been definitely made by the miners driven from the Atlin to the Porcupine claims. The fact is that the dividing line is by no means accurately known, and must be settled by a joint commission of England and the United States. It is to be hoped that Governor Brady's present visit to Washington will result in some definite steps being soon taken in this matter, which becomes of great importance as the surprising wealth and resources of the land are fully realized. Originally published in Cosmopolitan Magazine. May 1899.